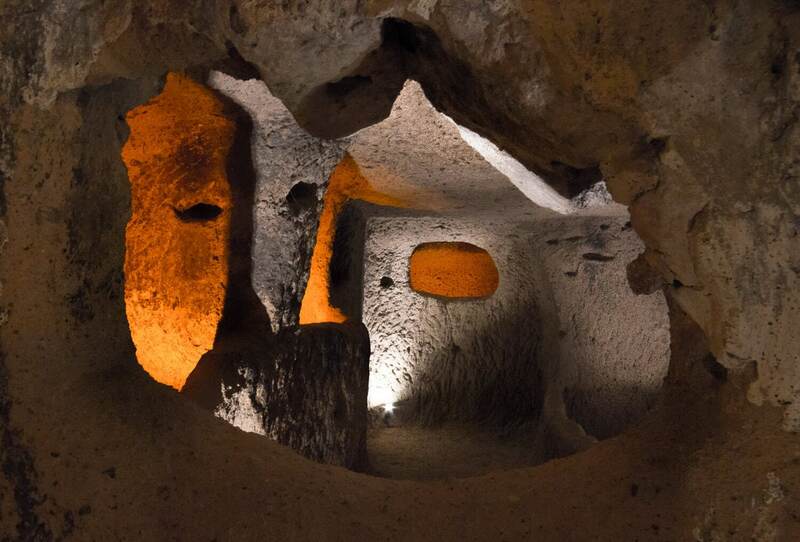 There are 36 underground cities in Cappadocia with Kaymakli and Derinkuyu being the most popular among visitors. 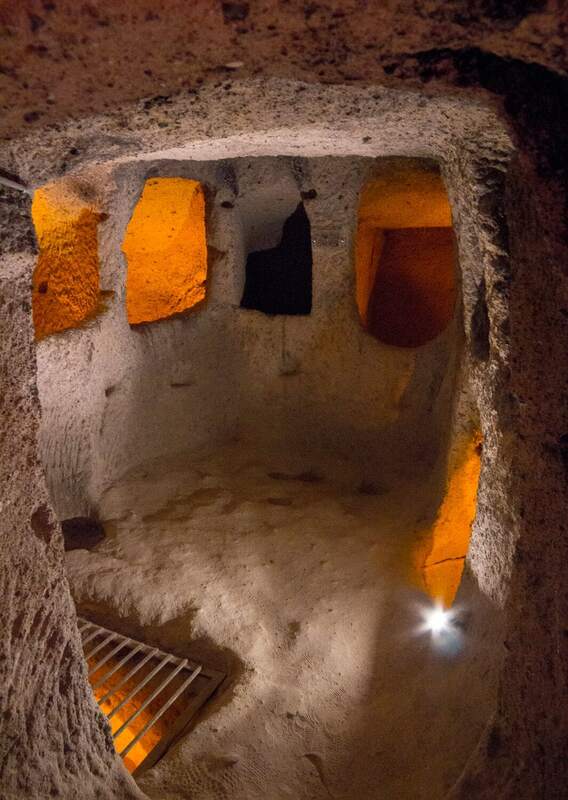 Kaymakli Underground City is a 30 minutes drive outside of Goreme and a super easy trip to make. Keep reading to find out how to get to Kaymakli from Goreme, the difference between Kaymakli vs. Derinkuyu, plus tips for visiting this fascinating place. 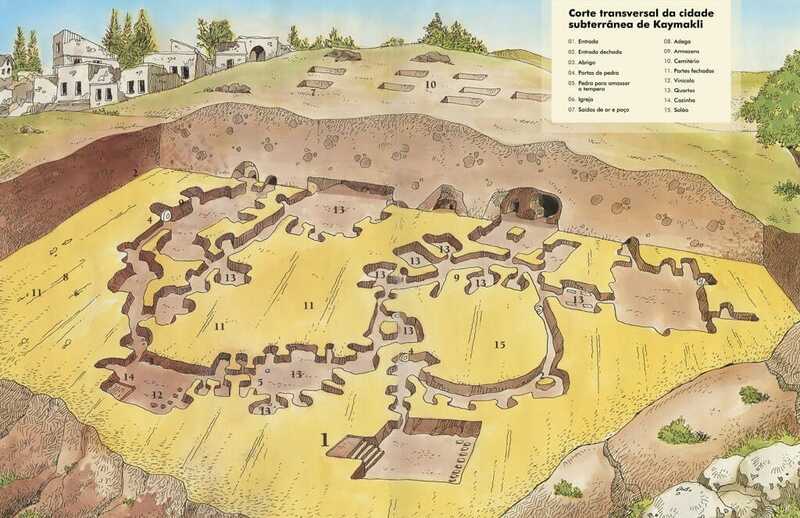 Kaymakli’s history dates back to Hittites and Phrygians Period in the 7th and 8th century B.C. 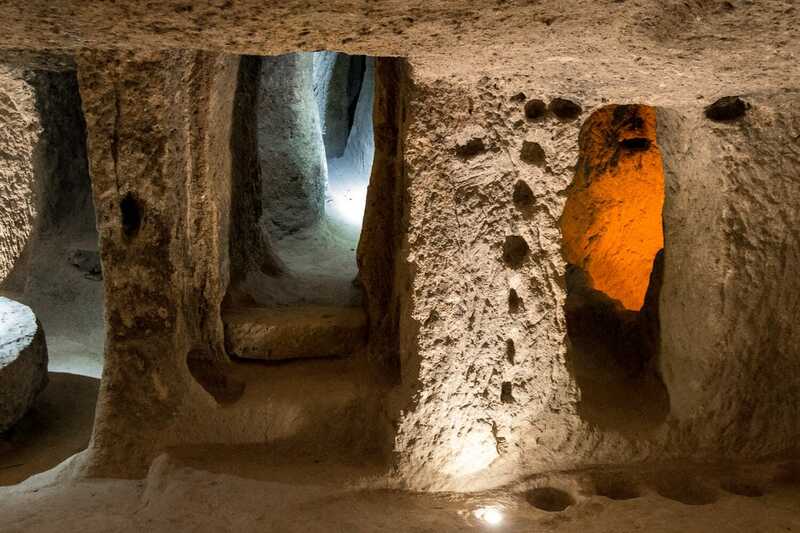 Kaymakli Underground City has acted as a safe haven for those fleeing from religious persecution, and it was mainly used by Christians during the Byzantine era for protection from invading Arabs. They estimate that up to 3,500 people once lived here. 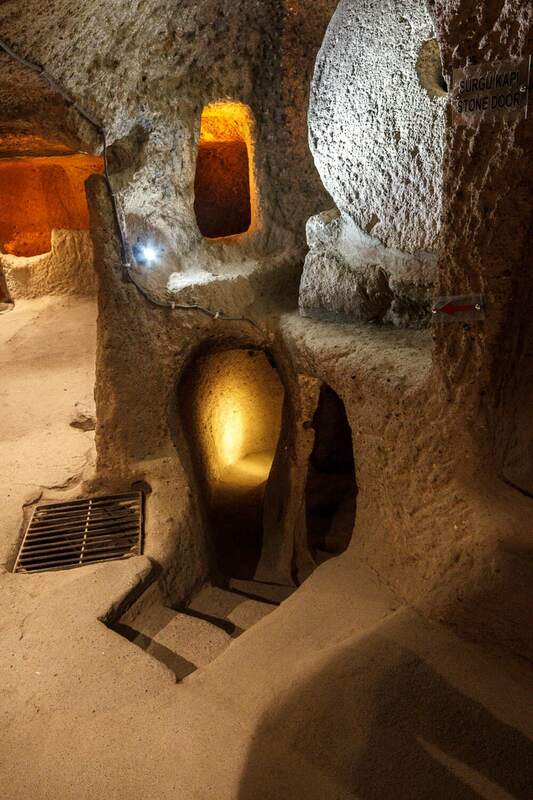 Kaymakli Underground City was opened to visitors in 1964 and became a UNESCO World Heritage Site in 1985. Before entering the underground city, we were approached by a local guide offering to take us on a tour. 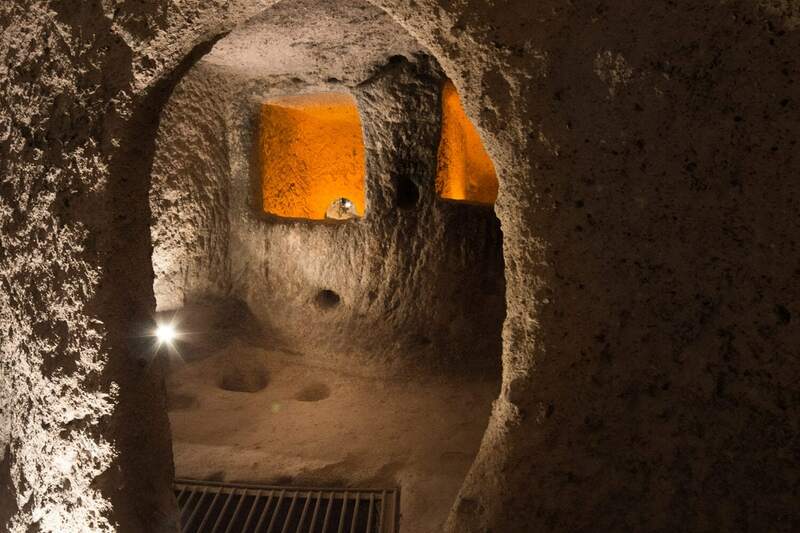 His name was Mustafa, he was 81 years old and was the very first tour guide of Kaymakli Underground City. He’s lived here his whole life and even used to play hide and seek in the city when he was a child. Mustafa was the perfect tour guide, he knew every nook and cranny like the back of his hand. He was considerably shorter than Nick and I and he literally ran through the tunnels while we slowly squat-walked after him trying to catch up. 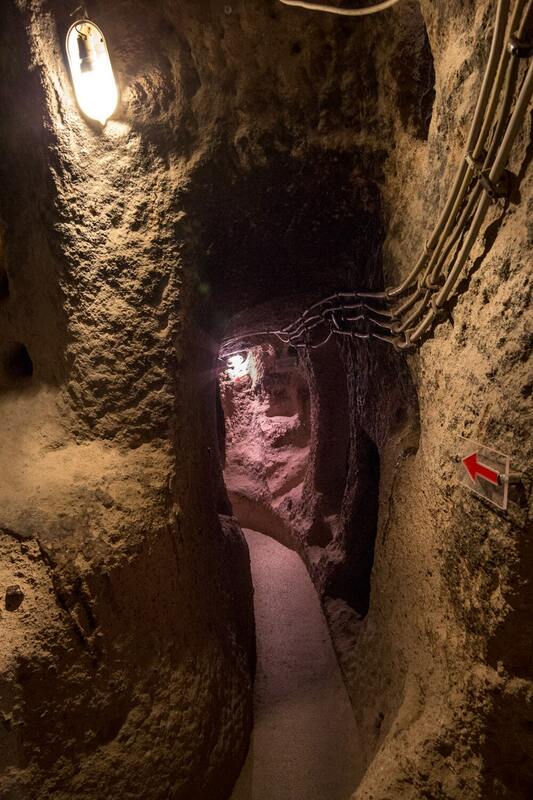 If you go through Kaymakli Underground City self guided, there are arrows leading the way. 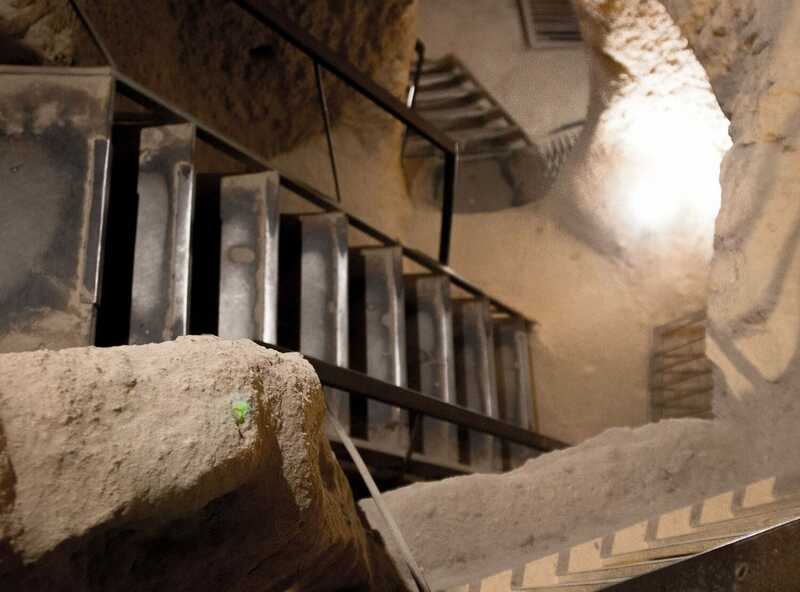 The city is 8 levels deep but only 4 are open to the public, with the fourth level being 20 meters below ground (65 feet). The city is arranged around ventilation shafts which descend 80 meters down (262 feet) and provides oxygen to all the levels. You enter the city at the first level, which was used as a stable for animals. As you progress you see the living quarters of the wealthier families. An entire wealthy family’s “apartment” had one small area where the mother and father would sleep, and several small holes where the children would sleep (see pic below). If you didn’t know what you were looking at, you would never guess people lived in these nooks. The further down you go, you’ll pass tons of storage rooms and cellars, as well as the lower class families’ apartments. Some of these were about as small as my shower. Mustafa likened the living quarter structure to the Titanic. The wealthier you were, the higher up you lived. While in the underground city, you’ll also see the church, common areas, and a large kitchen where they cooked food for the entire population. They could only cook once a month, and had to do it at night so that enemies wouldn’t see the smoke. 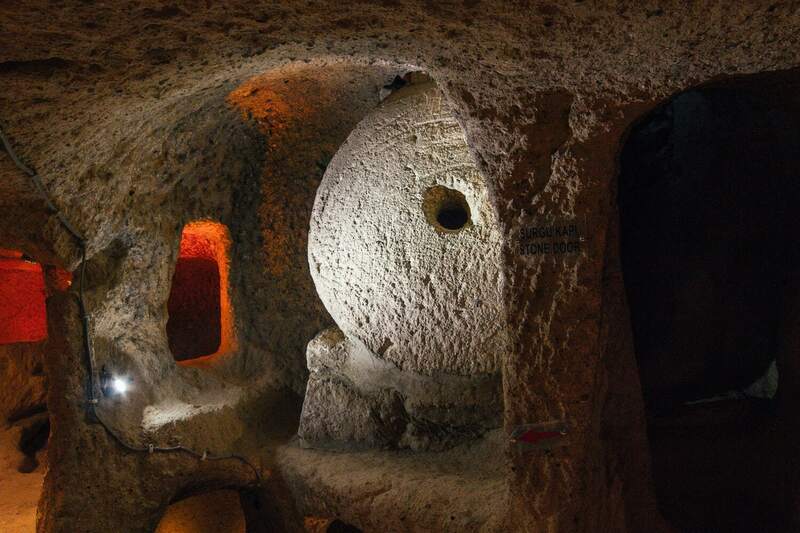 Throughout Kaymakli Underground City, you’ll see huge, round stone boulders. These were used to protect the inhabitants in case of an attack. Several men would to have to roll the boulder across a doorway, locking everyone inside and keeping them safe. 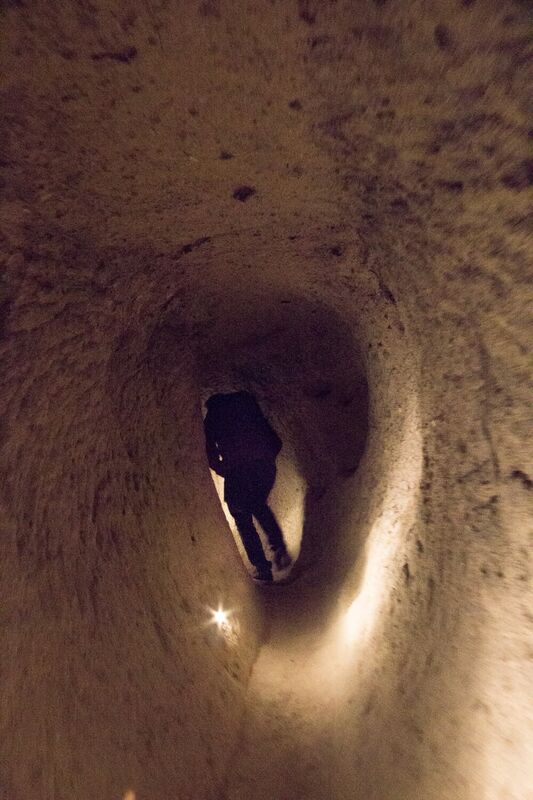 The underground city is like a maze; with all the tunnels, walkways and stairs, it’s easy to get lost. You will notice red and blue arrows throughout the caves. The red arrows navigate you down and through the caves while the blue arrows lead you up and back to the exit. 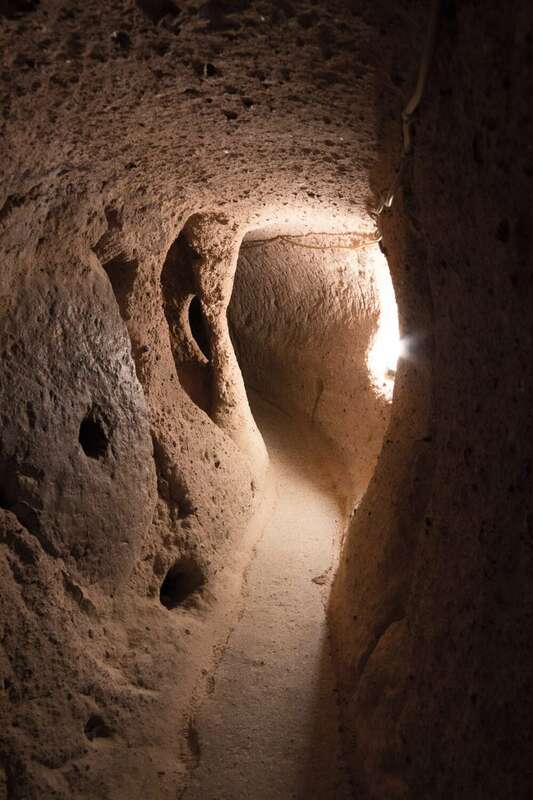 In some areas of Kaymakli Underground City, there are extremely narrow passageways paired with short ceilings. If you’re claustrophobic, this will probably trigger you. I’m not claustrophobia and I was pretty uncomfortable in some of the areas. I also can’t imagine being much taller and making it through a few of the secret tunnels. You have to basically squat and walk, and it was a tight squeeze. 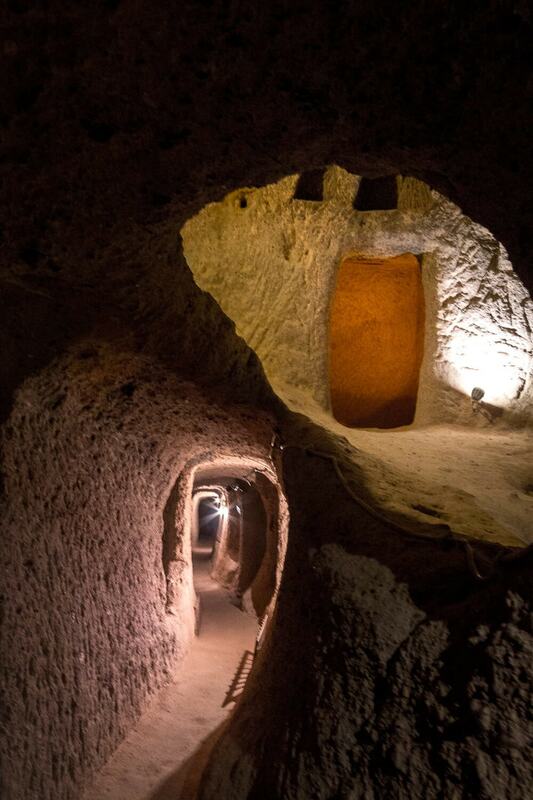 If you feel like you might not be up for this, Derinkuyu is another popular underground city with more open areas. 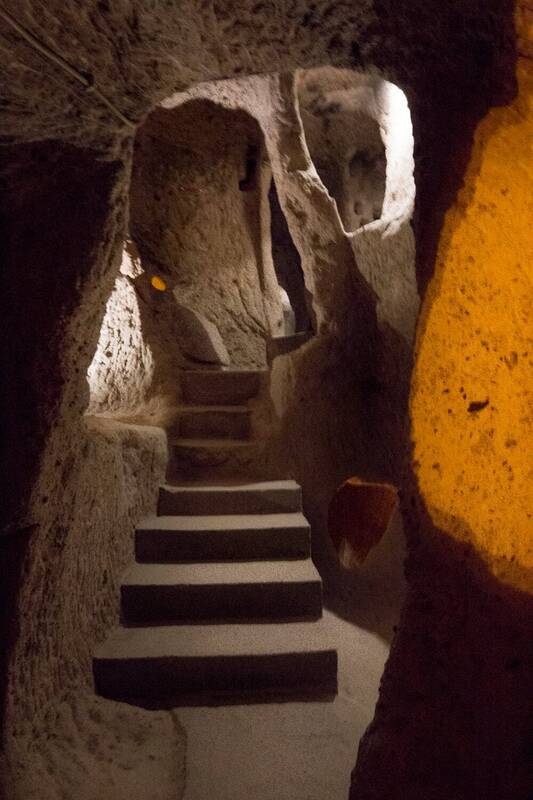 Going through Kaymakli Underground City without a guide would have made the experience so much less impactful. The city really doesn’t look like much without knowing what everything is. Mustafa had so much knowledge and he really was able to paint a vivid a picture of what it was like to live underground in this city. Guides were standing outside the entrance of the cave. If Mustafa is there, I recommend taking your tour from him. The tour cost us 75 Lira ($20 USD). He quoted us the price after asking where we were from, so I’m sure we could’ve paid less. I still felt it was worth it though, and I would pay it again. Mustafa told us his tour would take 45 minutes but it ended up being was closer to 25. He moved quickly so afterwards, we went back inside to explore a little more on our own. Our entire visit lasted about an hour and 15 minutes. I’d recommend giving yourself an hour to see the city; more if you have a lot of interest it’s history. According to a local tour guide on TripAdvisor, the best time to go is right after opening, during lunch time (12:30-1:30pm) or in the evening around 5pm. 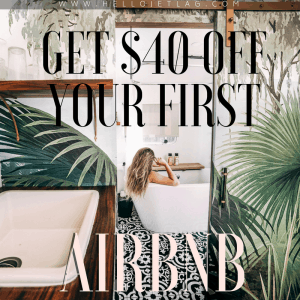 These times will help you to avoid the large tour groups that frequent the cities. There were only a few other people underground with us when we visited, so I can not imagine a claustrophobic traffic jam in those tight tunnels. 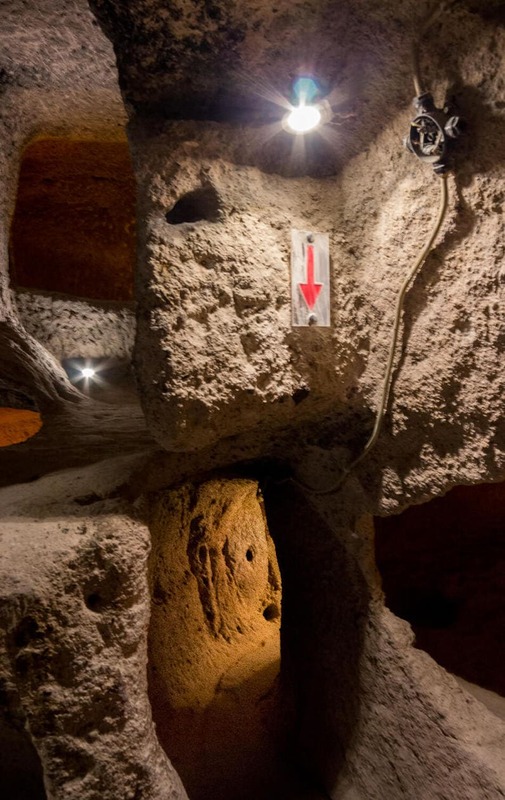 If you’re claustrophobic, tall, have weak knees or any other physical limitations, Derinkuyu will be a better fit as the ceilings are higher and the tunnels are wider . 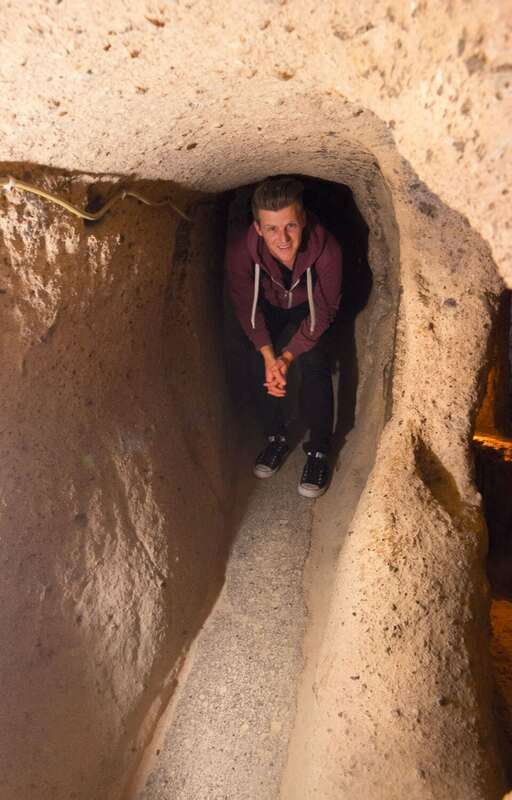 Kaymakli’s tunnels require crouching, and some can be very tight. I chose Kaymakli because I tend to go for the more intense option. It didn’t disappoint. 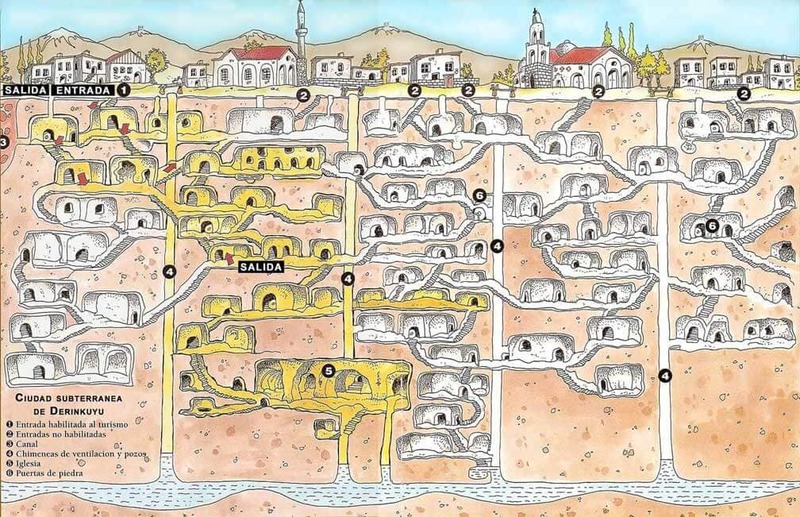 Derinkuyu is deeper (11 levels), but Kaymakli is the widest underground city in the region. Kaymakli is slightly closer to Goreme (25.7 km /16 miles) . Derikuyu is 35km (21 miles). The popular Green Tour of Cappadocia goes to Derinkuyu, so it might be a little more crowded depending on the time you go. 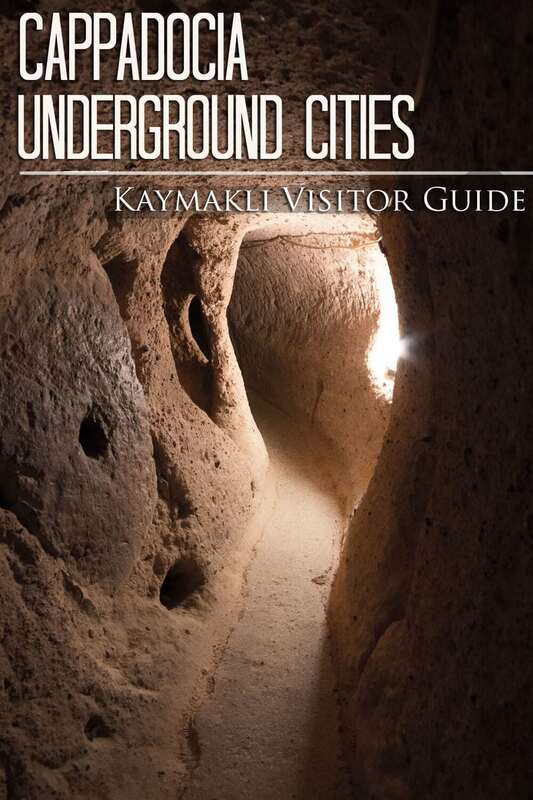 Kaymakli is the most visited underground city in the region. Derinkuyu is second. Kaymakli has multiple tunnels going in and out, Derinkuyu has one, so you have to take turns and wait for people to empty out. The visiting hours and ticket prices are the same in both underground cities. From the Goreme bus station, get on a mini-bus going to Nevsehir. 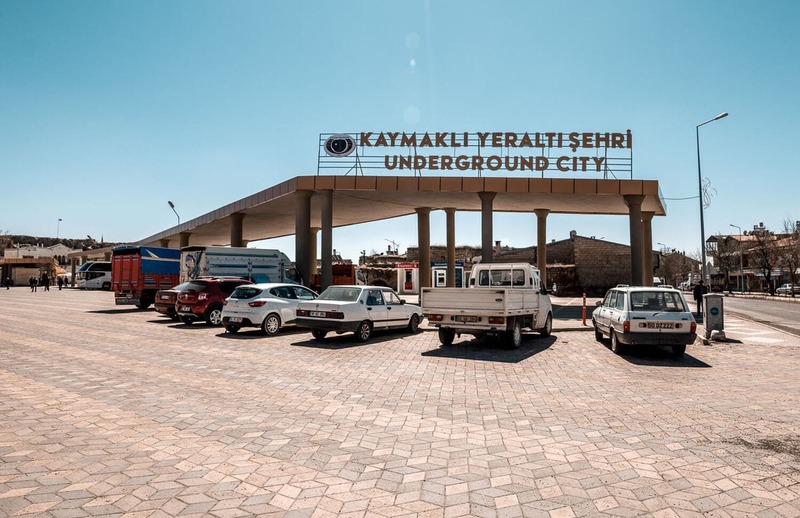 Tell the driver you are going to Kaymakli and he can tell you where to catch the next bus in Nevsehir. When you exit the bus, cross the street and catch the bus going to Kaymakli. 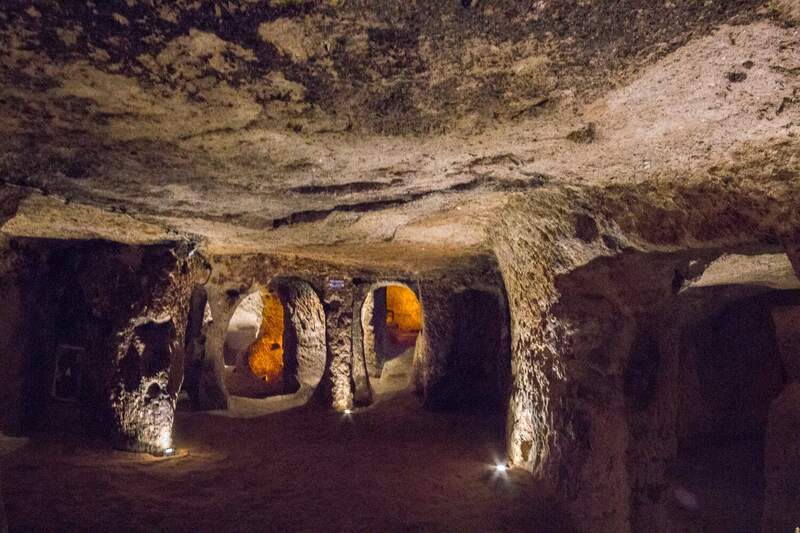 When you arrive, you’ll see a big sign for Kaymakli Underground City. You will walk through a big market to reach the entrance. A one way journey should cost less than $2 USD and take around an hour. If you are driving, Kaymakli is an easy 30 minutes drive from Goreme. It costs 10 lira ($2.80USD) to park.